What I don't know about the Amish could quite literally fill a barn (see what I did there :)? 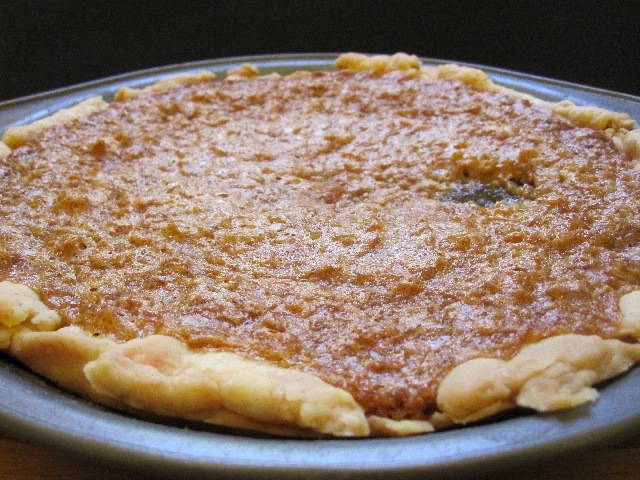 ), but one thing I do know is that the Amish make one fantastic pie. Though I could have speculated as much from just the ingredient list, which is eerily similar to my aunt's butter tart recipe only with a little more butter. Needless to say the idea of a gigantic butter tart on the same level as my aunt's left me visibly excited and may have perhaps blown my mind. 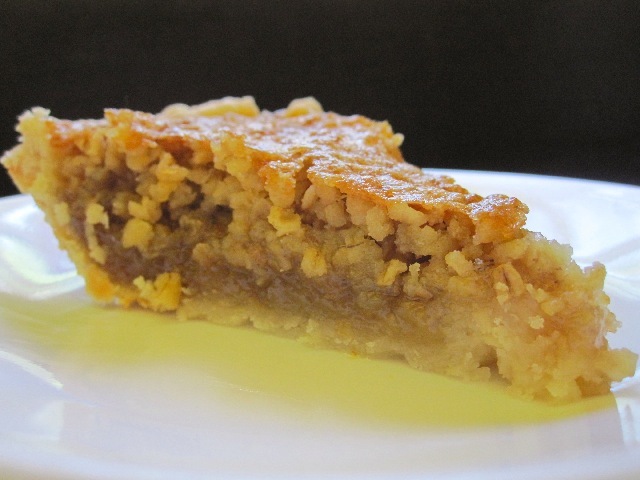 Not to mention that I had been craving pecan pie, and it was likely that this pie would be able to satisfy my sudden and rapidly growing craving. There were only a few things that I altered in the recipe. The most significant was to change the sugar from dark brown to light. I preferred my aunt's butter tarts this way and assumed that it would translate to this recipe as well. There is already so much sweetness that the extra molasses in dark brown sugar is overkill in my opinion. And because I don't own salted butter I used unsalted and added a bit of salt to the recipe. I also went ahead and added a little vanilla because, I dunno, I've been hypnotized to always add vanilla to my baked goods :). Like butter tarts the filling for this pie couldn't be easier, but if you don't feel like going through the trouble of making a pastry crust you could always try out the pat-a-pan crust listed in the original recipe; or even a graham cracker crust would probably taste pretty good (though a little sweeter). However, because I still had some frozen pie crust dough I chose to use that instead. Speaking of which, I have come to realize that I am absolutely terrible at rolling out pie dough. I think all my recent troubles might be because I didn't store the dough in a ball. Instead they were more like slices (or exactly like slices). This makes it a little more susceptible to tearing and nearly impossible to roll into a nice even circle. I've learned my lesson, next time I'm rolling each piece of dough into a ball before freezing. Although I have to say, I'm much happier being terrible at rolling out good pie crust dough than being terrible at rolling out awful pie crust dough :). Now I'm pretty sure that when it comes to baking pies most people have a specific process regardless of the recipe. I haven't really figured out what mine is. I was back and forth between quality time with my PS3 and the kitchen, nervously watching the pie bake. I actually took it out of the oven at about 40 minutes, the filling a lake of magma. And even though it was already on my cooling rack (though just for a minute or two) I decided to stick it back in the oven. Good call. When I went to take it out again, just the center had not yet set (about a 2 to 3 inch diameter), and the filling looked like it was bubbling just the right amount. Fingers crossed (and burned) I took the pie out of the oven for the final time and let it cool. I was planning on spending the night at my parents place, so when the pie was ready I drove it down to their house and talked my mother out of taking a piece immediately after my arrival (sorry Mom). We showed a great deal of restraint until Sunday afternoon when it was determined that pie was the perfect mid-day snack. I was happy to oblige and even happier after my first taste. The filling was set, the crust was flakey and the flavour was precisely what I expected. It was almost identical to my aunt's butter tarts and by that I mean heavenly. The oats help to balance the sweetness of the filling and gave it a slightly chewy texture. Even better was that the flavour of the oats became slightly nutty after baking and really did trick your brain into thinking that you were eating pecan pie. It was terrific. Despite how much I enjoyed it, as I ate the pie I immediately started thinking about how wonderful it would be as a maple oatmeal pie. Those flavours are simply meant to be together. And if pure maple syrup didn't require a second mortgage I would have done it already :). If oatmeal is not your thing I also think this filling would be wonderful for a pecan pie since it's so much creamier, and less sweet than a traditional pecan pie. But whether or not it's maple, oatmeal, or pecan, you simply can't go wrong with this recipe. I loved everything about this pie and it won't be the last time I make it. All the benefits of pecan pie with double the savings. Besides, using oatmeal instead of pecans means not only is it super healthy but when paired with a cup of coffee it is perfectly suitable as breakfast :). Add corn syrup, vanilla and salt and whisk until completely combined. Add oats and mixed until completely combined. Pour filling into prepared pie crust and place in bottom 1/3 of the oven to bake for 50 to 55 minutes or until all but the middle is set (about a 2 to 3 inch circle) and filling is bubbling (This was at 51 minutes for me, but note that I used a metal pie plate for this recipe). 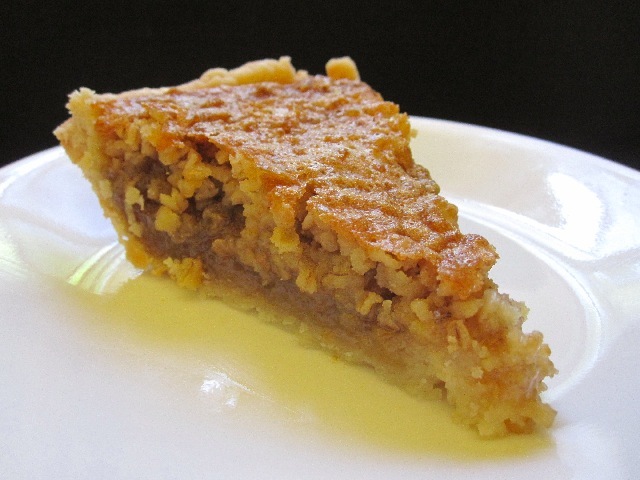 That looks like a rival to David Chang's 'crack pie'--actually, even better, given the texture of the oatmeal. The original crust looks intriguing--not having pie dough on hand, I might try it with the pat-in-the-pan crust. I'm not familiar with a "crack pie" and I'm too far into bed to check :). But since this is so close to my aunt's butter tart recipe, I'm just going to assume that it's better :). If you try out the original crust, let me know how it goes, I've been curious about it since the first time I read the article but never bothered to try it :). This pie would go great warm with vanilla ice cream I'll bet. I like that it uses ing. most of us have in our pantry...and not expensive pecans! 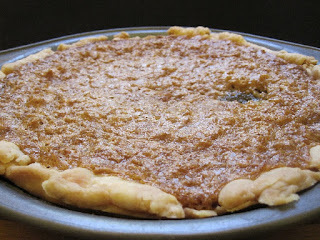 I love brown sugar and butter pies so I would love this. Did you know a pie just like that won a million dollars years ago in a Pillsbury Bake-Off? The unique additions were Nature Valley Granola Bars and chocolate chips. @Anna--no way! David Chang's pastry chef claimed that it was generated as a kind of 'get rid of the leftovers' dessert at his restaurant. I can totally see how using the granola bars would shorten up the process a bit, since the most time-consuming part of the pie is making the oatmeal cookies from scratch and then using it to make the crust. I think I might cry if I made oatmeal cookies just to grind them up to make a crust :). So where's the oatmeal crust to go with it?? ?